I’ve missed you guys! Between business travel and the flu, I haven’t been able to spend time in the kitchen lately. It sucked. Fortunately the flu is gone (save for the annoying cough that always seems to linger) and the kitchen has been calling my name! And to make things even sweeter, I discovered three bags of Kraft Caramel Bits in my pantry. I searched for recipes using these caramely bits of yumminess, and finally discovered this one. At first glance, these cookies are very unassuming. In fact, they’re even a little ugly. But when you take a bite, you realize these are no ordinary chocolate chip cookies. In addition to chocolate, there’s a rich buttery caramel that takes you by surprise. Now, before you run to your pantry to make sure you have ingredients to make these, I do have one gripe. If the cookies aren’t eaten straight from the oven, the caramel gets kind of hard. OK fine, really hard. And it sticks to your teeth in that super annoying way. Fortunately, this can all be easily remedied by putting the cookies in the microwave for a few seconds, but who wants to have to do that? And for those of you wondering if I would make these again, let me just say this: At 5:00 half of the cookies were still in the kitchen at the office, and we all know what that means. Totally unrelated to the cookie recipe: The nice folks at restaurantware.com must have known that the butter in cookies is ruining the backdrops for my photo studio because they sent me a bunch of different mini serving pieces to use for my food photo shoots. How cool is that? You should check out their site, they have some fun pieces! In a bowl whisk together flour, baking soda, baking powder, and salt. In another bowl with an electric mixer cream butter and sugars until light and fluffy. Beat in eggs, one at a time, beating well after each addition, and beat in flour mixture. Lightly dust chocolate and caramel with flour then stir into dough. Drop rounded tablespoons about 2 inches apart onto baking sheets. Bake cookies in batches in middle of oven 12 to 15 minutes, or until golden. 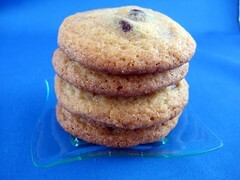 Cool cookies on baking sheets on racks until firm. Cookies keep in airtight containers 5 days. Chocolate and caramel…..so good and all wrapped up in one cookie. Love it! I didn’t even know there were caramel bits available! Sounds delicious!!!!! I will have to try this and see if it is something to do with the caramel bits used. There are a gazillion different kinds of caramel out there, and I don’t really know what the Kraft caramel bits are like. I love cookies with a surprise! And I love caramel. Mmmmmm. I think I might even be ok with the caramel getting hard. It just becomes a different kind of cookie then. 🙂 Glad to hear you’re over the flu. That is no fun at all.